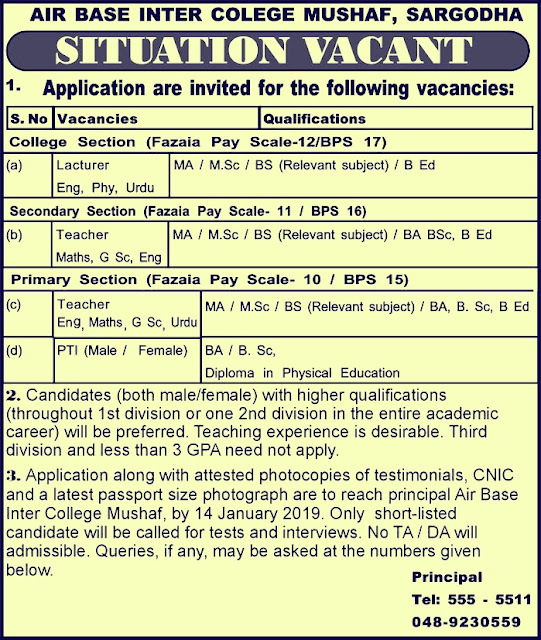 Jobs for a lecturer and school teachers in Air Base Inter College Mushaf Sargodha have been announced.You will be fully informed about the Air Base Inter College Mushaf Sargodha Latest Jobs 2019.Both boys and girls in the Air Base Inter College Mushaf can apply from Sargodha.Your education should be MA/M.Sc/BS to apply for this job.In this job you will also be given a great salary package and it is government jobs.In this job, all Sargodha people are eligible to apply.The third division in this job is not eligible to apply. If you have come to this site for the first time, subscribe it so that you can get information about the job of Pakistan.If you have any questions then you can do the comments below this article. Your education must be MA/M.Sc/BS/ BA, B. Sc, B.Ed. in order to apply for Air Base Inter College Mushaf Sargodha Latest Jobs 2019. To apply for this job you must go to college with documents attested photocopies of testimonials, CNIC and a latest passport size photograph is to reach principal Air Base Inter College Mushaf.